Proteomics: improving biomarker translation to modern medicine? Biomarkers are defined as 'measurable characteristics that reflect physiological, pharmacological, or disease processes' according to the European Medicines Agency . The ideal platforms for biomarker discovery include genomic, transcriptomic, proteomic, metabonomic and imaging analyses. However, most biomarkers used in clinical studies are based on proteomic applications as the majority of current drug targets are proteins, such as G protein-coupled receptors, ion channels, enzymes and components of hormone signaling pathways . Furthermore, linking the results of biomarker studies using protein-protein interaction approaches can assist in systems biology approaches and could lead to hypothesis generation and identification of new drug targets . Proteomic-based approaches for biomarker investigation can be employed in different aspects of medicine, such as elucidation of pathways affected in disease, identification of individuals who are at a high risk of developing disease for prognosis and prediction of response, identification of individuals who are most likely to respond to specific therapeutic interventions, and prediction of which patients will develop specific side effects (Figure 1). In line with this, biomarkers can also be used for patient monitoring such as testing for 'normalization' of a biomarker signature in response to treatment or screening for re-appearance of a characteristic 'pathological' signature. All of this equates to improvement in patient care by using biomarkers in so-called personalized medicine approaches . The progress and challenges in the translational application of proteomic technologies are highlighted in this new series, which features reviews written by leaders in the field on topics including post-translational modifications and protein-protein interactions in disease. 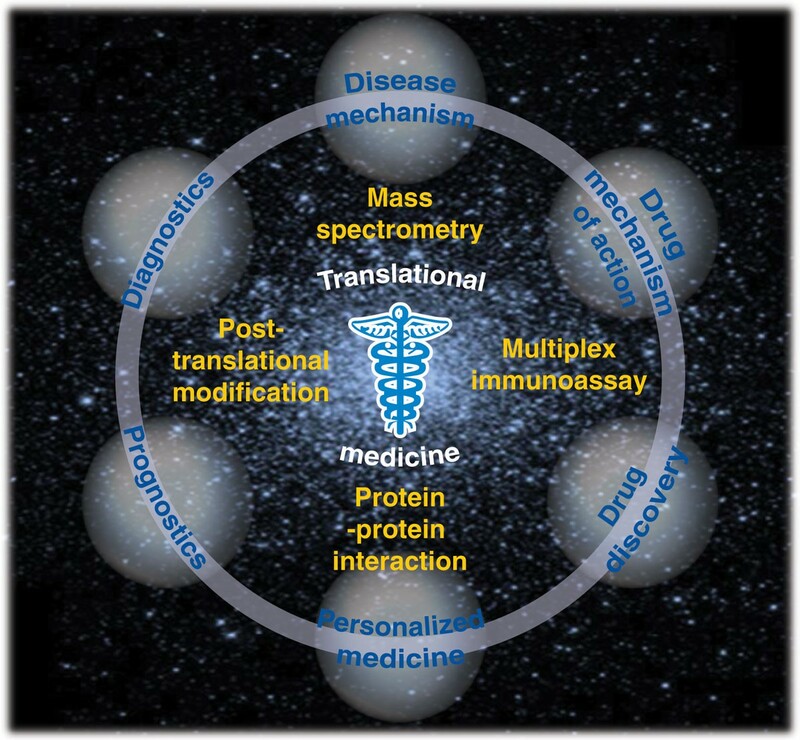 Ongoing and anticipated implementations of proteomic-based biomarkers in various aspects of medicine. Currently, there are only a few molecular tests that can predict response to certain treatments and these are mainly restricted to the field of oncology. Perhaps the best example of this is human epidermal growth factor receptor 2 (HER2) expression in breast cancer cells. This cell surface receptor can be blocked by the antibody-based therapeutic Herceptin™ (trastuzumab) . Such successes have raised hopes for discovery of biomarkers in other areas of medicine. However, in most cases, the claims for other novel biomarker candidates have not been proven in validation studies or in clinical trials. Potential reasons for this include deficiencies in design and analysis, the problem that drug targets and biomarkers may not be causal to the disease but rather a result of the disease process or a co-morbid effect, a lack of congruence of preclinical models with the human disease, or even because of factors such as the incorrect enrolment of patients in clinical trials who are too advanced in their disease stage to show any response to potential therapeutics . Nonetheless, a consensus has now been reached for testing biomarker candidates in the earliest stages of a disorder, as described recently for neurodegenerative conditions such as Alzheimer's disease . The suggestion that biomarker research has not lived up to the initial hype comes from the fact that publicized multiple 'breakthrough' tests have still not reached the market. This has led to skepticism from clinicians, scientists and regulatory agencies, which might make the introduction of valid biomarkers into clinical diagnostics or the drug discovery industry even more difficult. This is due in part to the lack of a connection between biomarker discovery with technologies for validation and translation to platforms that provide accuracy and ease of use in a clinical setting . Apart from some biomarkers in the field of cancer research, most have not been validated and have now faded from the spotlight. Major cancer biomarkers that have received Food and Drug Administration (FDA) approval over the last few decades include prostate-specific antigen (PSA) for prostate cancer, carcinoembryonic antigen (CA)-125 for ovarian cancer and CA-19-9 for pancreatic cancer . However, apart from the possible exception of PSA, most of these have been used mainly for monitoring treatment response and are not suitable for early diagnosis. It has been suggested that the best strategy for biomarker qualification is through their co-development with drugs . One of the best examples of this is the determination of the HER2 subtype of the epidermal growth factor receptor, combined with use of Herceptin™, as described above. In this case, patients who have high levels of HER2 are more likely to respond to Herceptin™ treatment . Thus, the use of scientifically and analytically validated biomarkers and rationally designed hypothesis-testing may lead to a paradigm shift in drug discovery and clinical trials. Researchers are now required to show that biomarkers are validated before they can be used in regulatory decision-making. According to the FDA, there are now three types of biomarkers based on proof of concept, validity and reproducibility (Table 1). The last category, which requires accurate replication of the findings, is where most promising biomarker candidates have fallen short. Currently, only long-standing and well-established tests have been used for regulatory decision-making, such as fasting glucose tolerance or glucose clamping to monitor insulin sensitivity . This work was supported by the Stanley Medical Research Institute (SMRI), the European Union FP7 SchizDX research program (grant reference 223427) and the NeuroBasic grant from the Dutch government. MGG is funded by a Gonville and Caius College - Cambridge Home and European Scholarship and an EPSCR doctoral training grant. PCG and SB are consultants for Myriad-RBM.